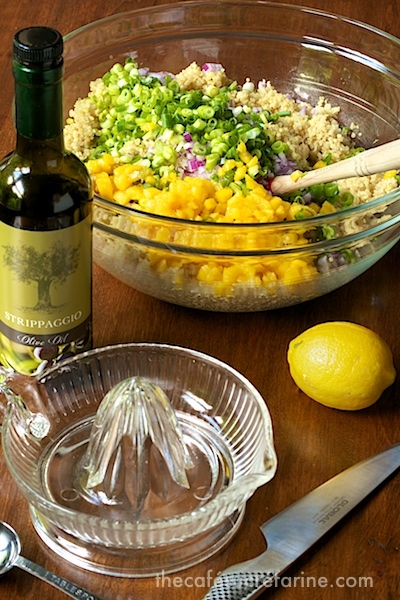 If you’re looking for something healthy, delicious and simple to prepare, whip up a batch of this Mango Quinoa Salad with Gremolata. You’ll be eating well all week! I’ve been snitchin’. Yup, at it again, up to the same old tricks. But please don’t tell my husband, Mr. Herb Gardener. You see, I’ve been warned, as I am each and every Spring. “Let the poor herb plants get a chance to establish, before you raid and scalp them!” Oh dear, I’m in trouble once again ………….. I had so much fun with my beautiful herbs! It was looking like it would be a busy week again here at The Café. I decided to make a healthy, fresh quinoa salad that we could enjoy today (Sunday) with some pan-seared salmon but one that we could also have on hand for quick lunches, dinners on the run and portable meals for taking to work. This salad fit all those bills plus it’s wonderfully delicious. Don’t worry if you don’t have an herb garden. I used a bit of basil, oregano, chives, mint and thyme (I tried to just take a little from each one so he wouldn’t be able to tell I was snitchin’ but unfortunately, he’s VERY observant). I also had a small bag of fresh cilantro* in the fridge and used some of that to make up the one cup of chopped fresh herbs needed for this yummy salad. You could use whatever type of herb combination you have available. Two of the small packs of herbs from the market would be perfect, along with some parsley and/or cilantro. Just use your favorite herbs. 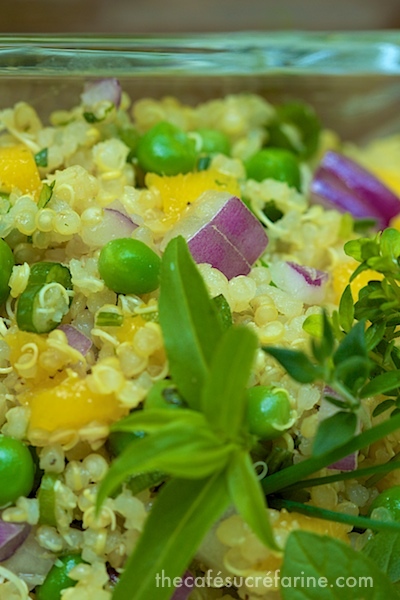 Did you know that quinoa is a complete protein? How about that that it provides all of the amino acids, including lysine which is essential for growing and repairing body tissue. And did you know the the name actually means “mother grain” and was so named because this super high amount of amino acids and vitamins. One cup of quinoa provides 9 grams of protein and 7 grams of insoluble dietary fiber, which has all kinds of health benefits including the fact that it helps lower triglycerides and blood cholesterol levels. 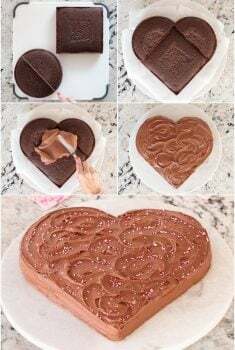 This helps your cardiovascular health and can assist in weight loss. 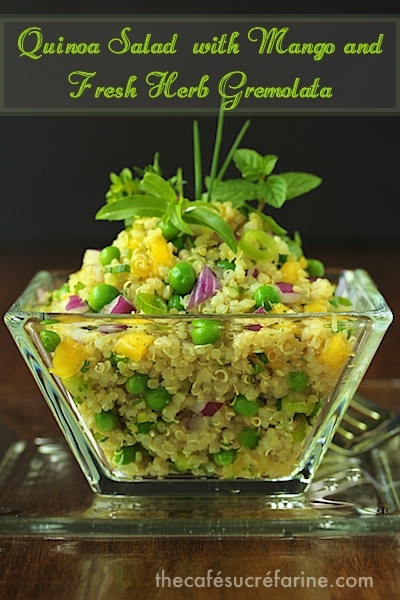 The fiber in quinoa leaves you feeling full, while only containing 70 calories per 100gm serving size. I love that! If you search “nutritional value of quinoa” you’ll find that it hosts just a ton of other health benefits but there’s another fact that was quite fascinating to me. 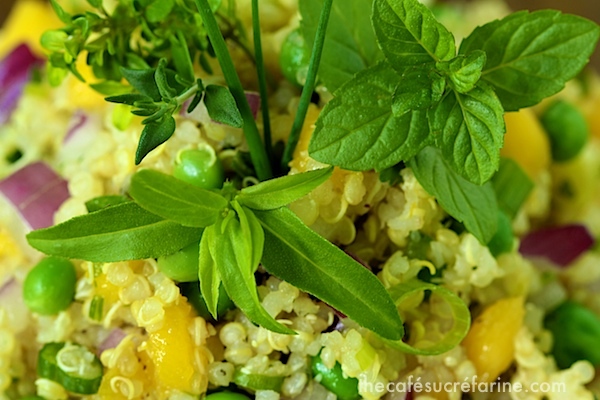 Quinoa was originally discovered in South American and was seen by the Incas as a sacred food. They are the ones who dubbed it “the mother grain and they planted the first seeds of the season in religious ceremonies using golden tools. It’s been said that depriving the people of quinoa was one of the ways the Spanish used to conquer the Incas! No quinoa, no protein, no energy! Wow, how interesting is that? To me, another wonderful attribue of quinoa is that in a culinary sense, it’s a blank canvas. 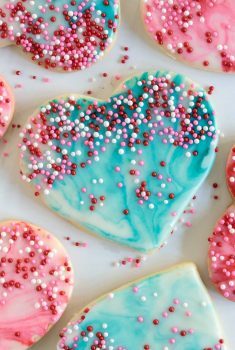 You can add all types of flavorful ingredients to it which gives it a zillion different personalities. This time I wanted to make it light and fresh and used fresh herbs for a burst of flavor. Another favorite of ours is this Black Bean & Quina Salad w/ Lemon-Cumin Vinaigrette, so good! 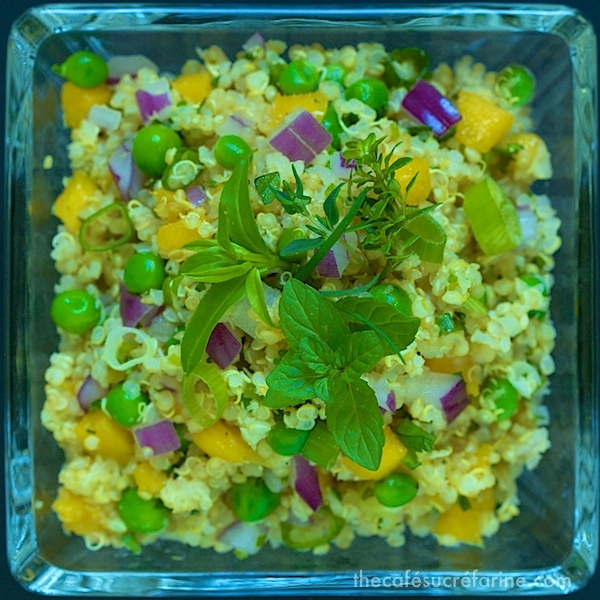 So if you’re looking for something healthy, delicious and simple to prepare (other than chopping a boatload of fresh herbs) whip up a batch of this yummy Quinoa Salad with Mango and Fresh Herb Gremolata. You’ll be eating good all week! P.S. If you’re wondering, gremolata is simply a funny word for an Italian chopped herb condiment typically made of lemon zest, garlic, and parsley. I like to use all kinds of fresh herbs in place of the parsley but feel free to use just parsley, it will still be quite delicious, you’ll just have to change the name of the salad! 1 large or two medium, mangoes, peeled and finely diced. 1. Cover quinoa with cold water and swish with your hand for 30 seconds. Drain in a fine strainer and allow to drain for 15-20 minutes, gently shaking strainer every 5 minutes to remove as much water as possible. Rinse and dry bowl for later use. 2. Heat a medium-large pan over medium heat for several minutes. Add quinoa and toast, stirring constantly, until all liquid is removed and you begin to smell a nutty aroma, about two minutes. Transfer to dry bowl. 3. Rinse pot and bring 3 cups of broth to a rolling boil. Add toasted quinoa and cover, leaving lid slightly vented to allow steam to escape. Reduce heat to low (maintain just a slight simmer) and cook for 14-16 minutes or until all liquid has been absorbed. 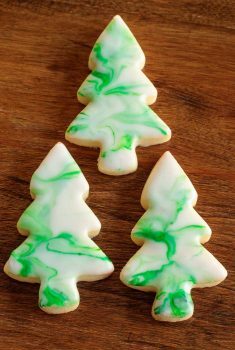 Remove from heat and allow to sit, uncovered for 30 minutes to cool while preparing rest of ingredients, then fluff with a fork. 4. Place chopped mango on several thicknesses of paper towel to drain off any excess liquid. 5. 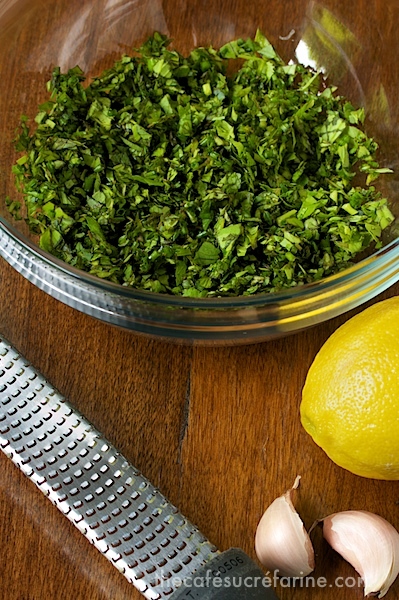 For gremolata, combine chopped herbs, minced garlic, and lemon zest in a small bowl and stir until well combined. ~ This salad will feed a crowd but also keeps well and is wonderful for leftovers. ~ There are lots of different methods for cooking quinoa. I find this particular method wonderful as there is no sogginess to the cooked quinoa which makes it great for salads like this. This is truly a vibrant dish, Chris! The colours, the flavours, the health benefits – it’s a kaleidoscope of tastiness! This looks beautiful, Chris! 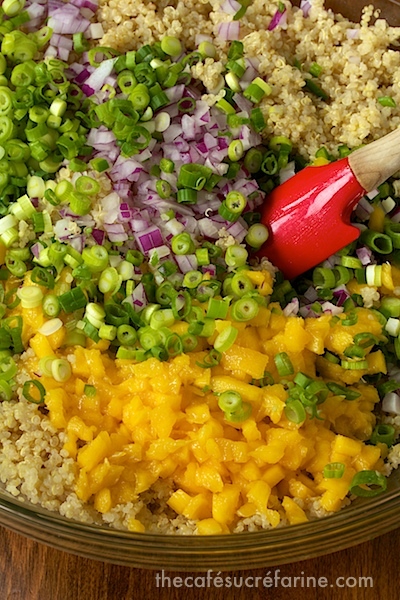 I make a quinoa salad with mango and it is always a huge hit. I bet your herb version is spectacular. I am trying to stay out of my herbs! I just planted them on Sunday, but there are basil leaves I just want to pick and use! Great salad, love quinoa! I have all those herbs in my garden Chris! Really need to experiment with quinoa again. 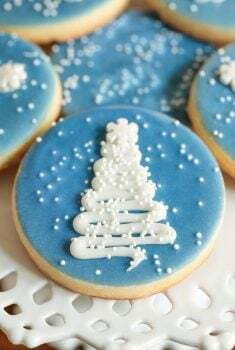 I like eating it but it never seems to be very good when I make it. I had the most delicious quinoa risotto in South America. They have perfected cooking with it after all those years! Quinoa makes such a delicious salad. I would be “snitching” too. I simply couldn’t wait!! Lovely salad chris! Looks light and flavorful!!! Your presentation is fantastic! Hope you had a peaceful and fun Mother’s Day. But I love how creative this is. You’re really great at this salad thing! Chris: What a fresh and beautiful dish…It is like to have a garden in a plate. I absolutely love this!!! I am a little quinoa nut..and I find it is so pretty.. Do you have the QUINOA cookbook? It’s really nice.. a friend gave it to me..